Sirius Global Animal Organisation (Sirius GAO) Sirius Global Animal Organisation (Sirius GAO), campaigning to end the export of domestic dogs to China for torture and slaughter for their meat and fur. "The one absolutely unselfish friend a man can have in this selfish world, the one that never deserts him, the one that never proves ungrateful or treacherous is his dog. A man's dog stands by him in prosperity and in poverty, in health and in sickness. He will sleep on the ground, where the wintry winds blow and the snow drives fiercely, if only he may be at his master's side. "He will kiss the hand that has no food to offer. He will lick the wounds and sores that come from the encounter with the roughness of the world. He guards the sleep of his pauper master as if he were a prince. When all other friends desert, he remains. When riches take wings and reputation falls to pieces, he is as constant in his love as the sun in its journey through the heavens". The above is a quote from US Senator Vest in 1870 when he was addressing the jury in a court case in defence of a dog. This was a part of his impassioned plea. On the 1st April 2000, Associated Press released a story of a well known Swiss Organisation, the International Association for the Protection of Animals who had called on the Swiss cabinet to prevent the sales of dogs to Asian countries, especially China, Vietnam and Korea. Spokeswoman Milly Schaer-Manzoli said it was impossible to know how many dogs were being exported because of a "wall of silence" from breeders but she knew of one woman who had sent five dogs to Korea. In China, a Saint Bernard breeder admitted his stud dogs came from Switzerland. "Switzerland is making itself look ridiculous by offering its national dog on a silver platter to satisfy the customs of populations who don't even have the excuse of being hungry", said Schaer-Manzoli. That is what started me on the crusade to stop this abhorrent trade and to protect all dogs in the future. 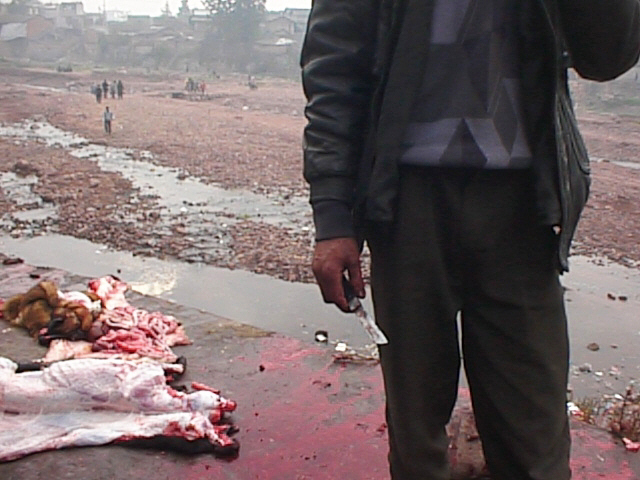 Switzerland is not the only country exporting dogs to China for the meat trade. Along the way I met Ilaria Ferri who has become the European Co-ordinator in Rome, Italy and Maggie Hansen in Norway. Between us we gathered over 4.5 million signatures and supporters in 18 months from 45 countries. The Petition struck a cord with the average person who was and is horrified that these beautiful, gentle animals who have always been bred solely as domestic companion animals were being imported into those Asian countries named above and bred and slaughtered for human consumption. As time went by, more and more evidence was gathered, heartbreaking evidence. Some of the pictures appear on this site. Never before in the history of this planet have our domestic dogs been exported as food and it is time to put a stop to this. The dog has come a long way with humans. The partnership between the two transcends most things. Throughout the years dogs have been bred in the West and Europe for many reasons such as hunting, for herding and for guarding. Search and Rescue has also been a large part of the role some breeds of dogs play in the lives of humans. These breeds are in particular the Saint Bernards, German Shepherds, Labradors to name a few. After the September 11, 2001 tragedy in New York, the world media called the Search and Rescue dogs "canine heroes" yet these are the same breeds being exported for food. Seeing Eye dogs, Hearing Dogs, dogs used in comfort for the elderly in Rest Homes and Hospices; do these animals deserve to be left to a fate indescribable at the hands of a country, namely China, that has no regard to any animal let alone the dog? No animal welfare exists in that country. The Petition has now been presented to the Food and Agriculture Organisation of the United Nations. This happened at 12.20 pm on Friday 2nd November 2001. This is Stage 2. Stage 3 is now in progress. It is up to the people of this planet to put pressure on their individual Governments who appear to be protecting their Foreign trading partner, namely China in that they refuse to even discuss this situation with Chinese Ambassadors. The dogs MUST be classified. The list exists with the FAO United Nations and can be seen also on this site. Judge for yourselves. Dogs do not appear on this list, yet China has decided they are now livestock. Say No! Strongly. 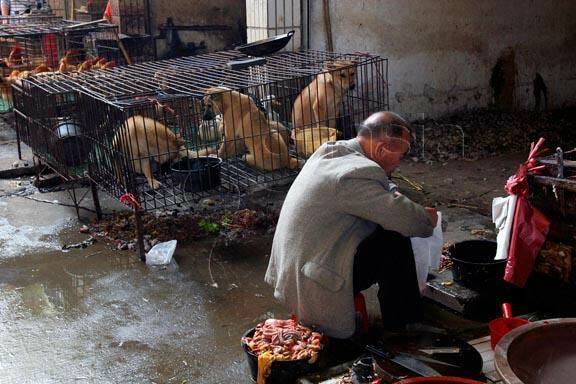 When China opens the dog meat market and dog breeding industry, it will gradually become like raising cows and sheep. Buyers of the Saint Bernards include farmers and small businessmen who come from all over China hoping to make some money on the side breeding dogs. They are drawn by ads boasting of a high rate of return, three times as profitable as poultry and four times as profitable as raising pigs, the ads promise. He said he welcomed investors from the United States or anywhere else to help them expand their operations. So far in China there were industrial breeders for cows and pork but not for dogs until Saint Bernard industrial breeders appeared. "Because foreign people resent the dog-eating habit in some areas of China, they are not willing to sell their pet dogs to China which causes some difficulty to our importation. Currently we are trying to negotiate with foreign companies on how we can import stud dogs in order to meet the internal needs". Affidavits exist from breeders approached by people with businesses in China wanting to buy whole litters of Saint Bernards alone. The Swiss have photographs of a Saint Bernard being killed which are too horrific to be released. Watch this horrific video of an Alsatian wagging its tail before the vein in its leg is slashed open. It is finally hung on a meat hook to drain fully before it is skinned and butchered. The New Zealand First Party has seen video evidence of the dogs having their legs broken the night before slaughter and who are then skinned alive the next day. 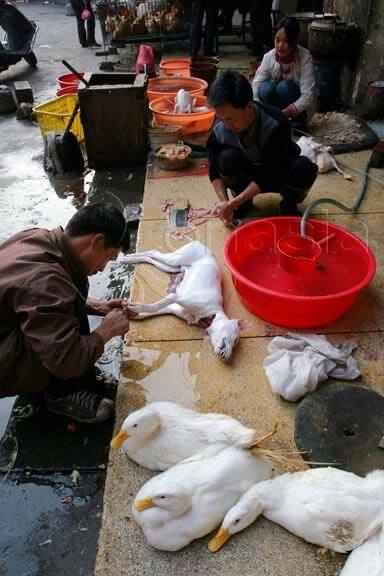 Imagine the pain the animals suffer! The Chinese admitted recently that one of the ways the dogs are killed is to cut holes in their paws so they bleed to death. It takes a while but gives the meat the quality they like. Please support this cause and write letters to your respective Governments. This situation must stop now! So often we have been told that we are interfering in another country's culture however the point seems to have been missed totally by the Asians. The dogs they are importing belong to our "culture" for want of a better word. Culture actually has nothing to do with food - this is cuisine so therefore we are more than entitled to fight to protect OUR animals. This is a totally unique situation. Never before in the history of the world have OUR pets been exported for food. Let us then all band together and do whatever we can to fight this abhorrent situation. Remember!!!! 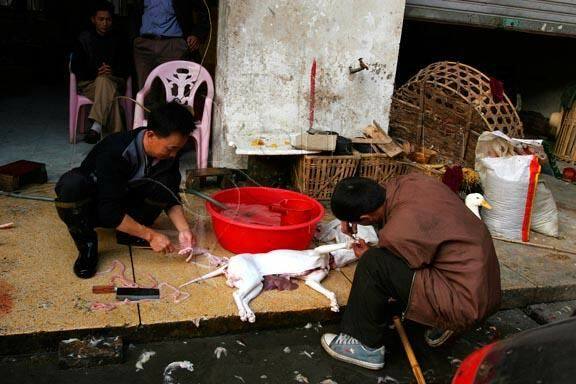 The Koreans are teaching the Chinese how to breed and slaughter the dogs! Full lists of pages are in the bar at the top of the page. Hover over the blue buttons for complete lists of options.